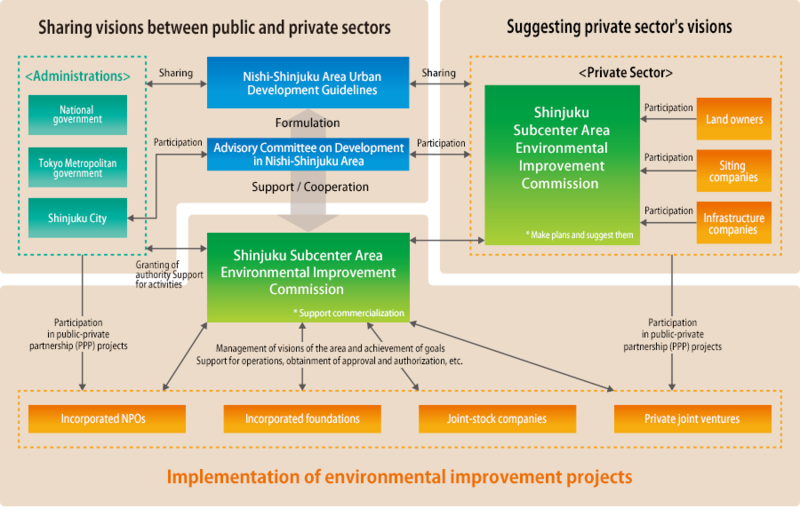 The purpose is to promote urban development that contributes to the realization of environmental improvement and area value enhancement by producing prosperity, low carbonization and boosting the disaster prevention ability in Shinjuku Subcenter area (the area where urban planning is to be implemented in accordance with the Tokyo Urban Planning at Shinjuku Subcenter Area). To achieve this purpose, members of the Shinjuku Subcenter Area Environmental Improvement Commission (hereinafter referred to as “the Commission”), mainly consisting of incorporated landowners, commit to cooperating with public administrations and the local community. The Commission is working to further revitalize the area through the use of existing resources and by various efforts including forming concepts, planning, providing information and designing and implementing specific projects for development. Formulate the "Nishi-Shinjuku Area Urban Development Guidelines," a future vision of the area, which is shared by both public and private sectors. Create plans for and promote urban development projects in accordance with the urban development guidelines. On the basis of the activities and results of the Commission launched in 2010, the Advisory Committee on Development in Nishi-Shinjuku Area was inaugurated in 2013. It is a public-private partnership organization through which Shinjuku City and the Commission cooperate. To share a future vision of the Nishi-Shinjuku area and promote its realization, we discussed and formulated the "Nishi-Shinjuku Area Urban Development Guidelines" in 2013. What is the Shinjuku Share Lounge? In the "Nishi-Shinjuku Area Urban Development Guidelines,” the area sets a future goal of creating a central Tokyo where a new urban life support industry emerges. As part of this, we aim to boost competitiveness of Nishi-Shinjuku by establishing open spaces owned by the public or private sectors, which are used for multifunctional purposes. These include creating new industries and providing information to the world for the medium-to-long term. "Shinjuku Share Lounge" is a social experiment to verify the effect of the creation of new urban spaces. Under this plan, lounges and showrooms would be deployed in open spaces owned by the public or private sectors, temporary buildings would be set up in open public spaces, road space would be utilized and the functions of each district would work together. In the future, we aim to realize an "urban showroom" that would be used for various business situations and lifestyles in addition to the enhancement of the area value of Nishi-Shinjuku. At the same time, we would introduce various uses of private buildings, while also promoting the extension and reconstruction of low-rise parts of buildings and public open spaces.